The course has been designed for candidates who have completed ECDIS generic training and now require equipment specific training. It has been designed for officers in charge of a navigational watch, for experienced officers and other persons with navigational responsibilities. Those attending the course should have conducted a generic 5 day IMO 1.27 ECDIS course. They should have experience in performing chartwork and should be able to practice all usual tasks concerning standard navigational procedures and equipment. They should know about the functions and limitations of other navigational equipment. ECDIS is not aiming to teach trainees to navigate using ECDIS. It is teaching them to use ECDIS in order to navigate safely. Therefore, we require the trainee to have the basic navigation knowledge and that they understand what a navigation watch entails. We at Ecdis Ltd are of the opinion that traditional navigation techniques are still relevant in a digital world and as such we will teach the use of existing navigation skills on an ECDIS system. 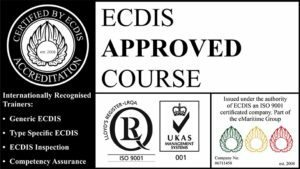 Your training is important to us here at ECDIS Ltd and because of that we have ensured there are no minimum booking numbers for any of our type specific courses. All type specific training can be scheduled and conducted for one student. Classes are limited to 2 trainees per terminal in most circumstances. Maximum numbers do apply and vary across different manufacturers – please contact us for further details. All of our trainers are specialist navigators that are highly experienced in the practical use of ECDIS. Combined, our trainers have taught over 1000 mariners. Superb day with great resources both human and electronic. which feels modern and fit for purpose. A good brief introduction to the Sperry system, very useful pre-information before using for real.